I can vividly remember the first meal Chef Doreen Prei ever made for me. She had invited me for dinner at Zinc Restaurant, where she was the chef de cuisine, as a thank you for including her on a feature I had written for Where Edmonton on art-inspired/stylish food. The five-course meal was exquisite; visually stunning and unlike anything I had ever tasted before. Her chef’s menu was my first introduction to gourmet food, and the best part, it was made especially for me. Chef Prei still has that effect on me with her cooking. Most recently, I had the pleasure of experiencing brunch created and executed by Doreen at Get Cooking (a teaching kitchen that can accommodate pop-up meals located in the MacEwan Residence in Oliver). The space and concept is perfect for someone like Doreen who is a natural-born teacher. Although she trained in a Michelin Star restaurant in Germany, and even worked at a Gordon Ramsey restaurant in Ireland, Doreen is not a food snob. Sure, her standards for ingredients and what the final dish should taste like are high, but she is so inclusive when it comes to cooking. She truly wants everyone to be able to create great food in their own homes using the ingredients they have available. The open-kitchen concept at Get Cooking allows Doreen to be in the spotlight. She can entertain and educate guests throughout a 90-minute brunch seating, sharing tips and tricks about how she made each dish or enhanced an ingredient (like splitting a brie in half, shaving truffles from Mo-Na Food inside, and then splashing truffle oil on top once it was sealed back together). If you are open to experiencing whatever Chef Doreen Prei may be inspired by that day – she will be cooking up two pop-up brunch seatings at Get Cooking on Saturdays. In true Doreen style, the menu will change each week and will feature seasonal ingredients, local producers, and products from local stores such as Bonjour Bakery. Tickets can be pre-purchased on-line and may be available at the door (if not already sold out). The price is $45 per adult, $22.50 for children between the ages of 7 and 13, and children 6 and under eat for free. It includes coffee/tea, a welcome cocktail, three hot entrees, a cold table, and dessert. And of course – it includes the feeling of having a specially crafted meal prepared for you by Doreen. I attended the 10 a.m. seating of Get Cooking’s first brunch with Liane Faulder on Saturday morning where Doreen, Kathryn Joel, and the staff at Get Cooking put on a real show. Upon arrival guests are invited to visit the European-style cold table which on my visit included cheeses, meats, sangria scones with clotted cream, and house-cured Arctic Char. Back at our seats we found Bonjour Bakery breads with homemade butter waiting for us (Doreen even had toasted gluten-free bread available for me). While Kathryn served up a combination of freshly-squeezed orange and grapefruit juice, Happy Byrne introduced patrons to a Mid Morning Revivor (a.k.a. the perfect brunch punch). For the first warm dish, Chef Prei shared a dish from her German childhood called strammer max. The open-face sandwich featured a toasted piece of bread topped with sautéed bacon, onions and an fried egg. Next – Chef Prei layered braised beef short ribs on top of a potato and leek gratin – the cheesy dish was a meat & potato lovers dream. For the vegetarian hot dish, Chef Prei served us potato rösti topped with yellow tomatoes, mozzarella, basil and balsamic vinegar. The veggie stacks were simple yet delicious; even though I was stuffed I managed to go for seconds. For dessert Doreen made this gluten-free girl a bowl of fresh berries and pomegranate with vanilla cream. For everyone else, Doreen continued with her German-inspired brunch theme and finished the meal off with a pomegranate strudel with the vanilla cream. I walked away pleasantly plumper than when I arrived and calculating how soon I could bring The Spaniard back with me for another one; brunch with Doreen at Get Cooking is a unique dining opportunity I can’t wait to experience again. 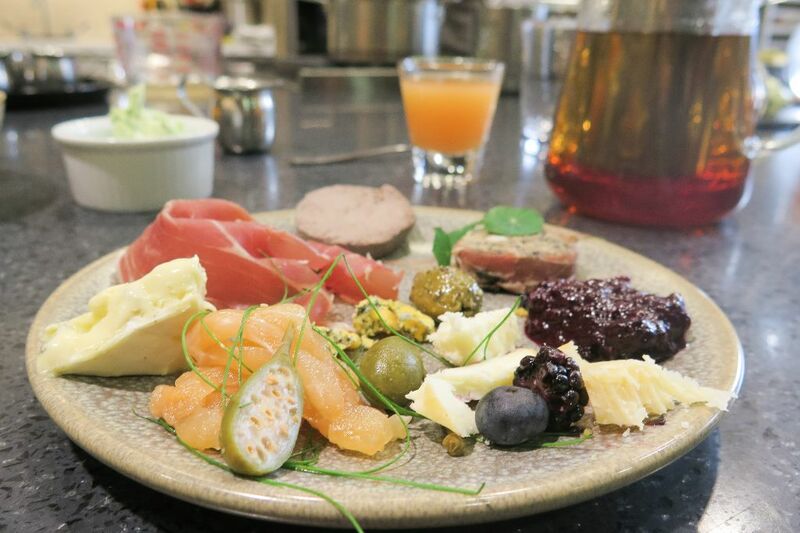 Although buying tickets to a Saturday chef’s menu, family-style brunch may be out of the comfort zone of some Edmontonians – I anticipate that brunch with Doreen will become one of the hottest tickets in town. Secure your spot here. Thank you again to Chef Doreen Prei, Kathryn, and the rest of the Get Cooking staff for a great meal. I’ll be back soon!